Apparently, organizations that empower individual potential of their employees have more opportunities to outpace competitors. Objectives alignment can help companies to use employees’ achievements effectively for the benefit of the organization strategy. The entire organization achieves vision together. The best way to maximize performance of an individual employee is to link their objectives with the strategy and vision of the organization. Such connections should be developed purposefully and in such a way that they are fully understood by anyone in the team and how employees’ work supports their department and company strategy. The company uses its vision as a starting point. Then it creates a strategy that follows this vision. Next, the departments define their objectives and activities that must be performed to achieve company goals. As a result, department employees can set their own objectives in the context of the organization’s strategy. The common effort of individual employees and departments form the foundation of organizational success. The process of creating alignment begins as the mission statement and is spread through the company organizational structure to employees. This model creates a culture of meaningful work, flexibility, and autonomy. Everyone in the team understands the importance of his/her work and personal impact on the company’s success. If personal objectives are set out in isolation, enormous efforts can be wasted on something that is not the most important or the most urgent. That is why objectives must be based on the overall strategy of the company. 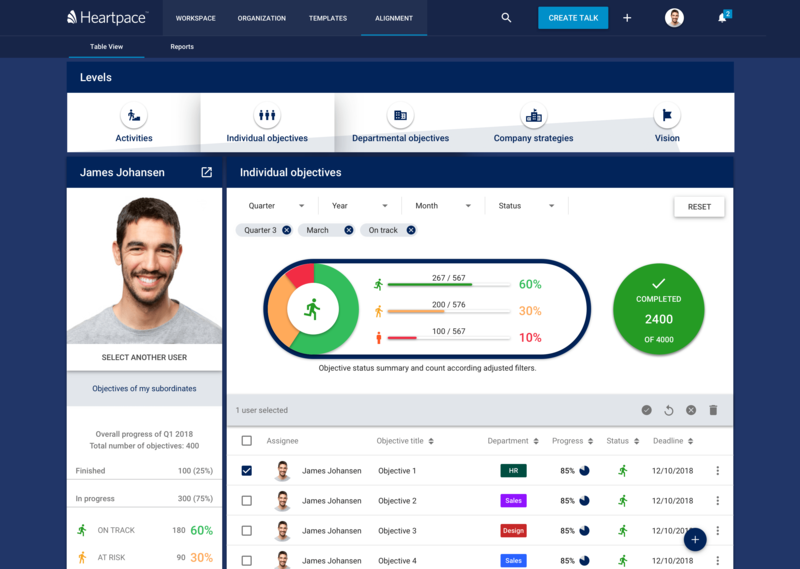 Heartpace is a flexible and simple tool for organizational alignment. In our latest update, we introduced new alignment level in the form of "Department", which gives the possibility to align from the organization's vision via strategy, department and individual objectives and activities. Get to know how can Heartpace help you with achieving your goals!